I hope Cuba's policy is not shaped by political fear or the desire to protect government/ETECSA revenue and that the US delegation is not trying to influence Cuban politics or maximize the profit of US telecommunication companies. 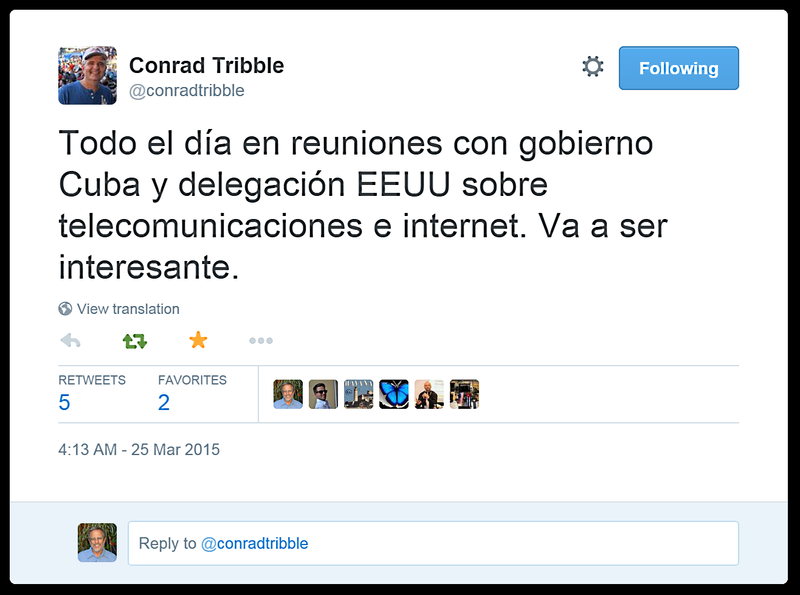 Conrad Tribble, second ranking diplomat at the US Interests Section in Havana, posted a tweet this morning saying a US delegation is meeting with the Cuban government today to discuss telecommunication and the Internet. Last month, Roberta Jacobson, who is heading our negotiations with Cuba, said the meeting would be to ascertain how we could "work with the Cuban Government on increasing its capacity for greater internet connectivity to better support access to information by the Cuban people." The US has indicated that, in spite of the trade embargo, we are willing to offer Internet infrastructure and services to Cuba and I suspect that the purpose of this meeting is to begin to learn what the Cuban government and ETECSA are willing to allow. I hope Cuba's policy is not shaped by political fear or the desire to protect government/ETECSA revenue and that the US delegation is not hoping to influence Cuban politics or maximize the profit of US telecommunication companies. 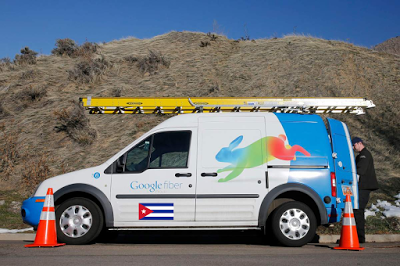 Cuba has little legacy Internet infrastructure to protect -- it is a "green field." I am not betting on it happening, but they have a chance to build a uniquely Cuban Internet to serve the Cuban people. As Conrad Tribble says, this meeting should be interesting. The talks were completed this afternoon. Voice of America reported that the delegation, led by Daniel Sepulveda (@DSepDC), the U.S. State Department's coordinator for international communications met with Cuban officials led by deputy communications minister Jose Luis Perdomo. A statement by Havana says the Cuban side offered the U.S. delegation information about the country's computer systems and cybersecurity policy. Mr. Perdomo headed the organizing committees for the 2011 and 2013 Informatica conferences and says the limitations on Cuban Internet access are technical, not political and has stressed the government's willingness to open Internet access to the general public. Let's hope he is sincere and represents current thinking of the Ministry of Communication. The US delegation visited the Ministries of Foreign Affairs, Trade and Foreign Investment plus ETECSA, UCI & ISPJAE. We are starting to see some reaction to the US delegation to Cuba. Reuters reports that Cuba said they are committed to getting "Web" access to 50% of the households by 2020 and a US representative said that "as long as the Cubans create an environment that's attractive to investment ... and attractive to the delivery of services, I believe those services will reach the island." 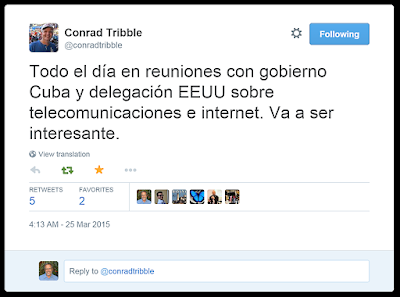 (Does that mean Cuba wants 50% international Internet access)? A post on the Havana Times blog asserts that the fix was in from the start and Cuba will hand over telecommunication to the US. 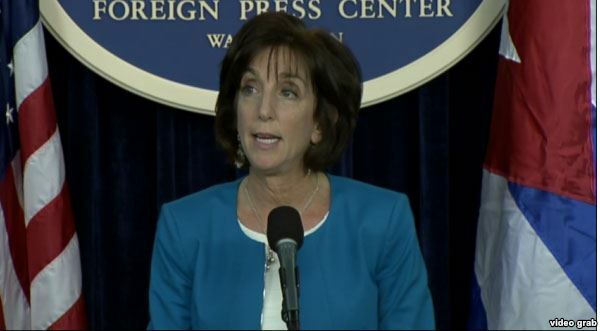 Roberta Jacobson, Undersecretary of State for the Western Hemisphere says that Cuba remains undecided on how to modernize their telecommunication infrastructure -- "I do not think they have taken a decision yet -- it's a fundamental dilemma for them. They will have to decide which route to take, what kind of system, how much to do and how fast." An article in Politico says another high level delegation is going to Cuba to meet with government officials to suggest ways to improve connectivity. Google is featured in the article and is said to have a specific proposal, but there will be around a dozen others. I know of one of the other companies and they also have a specific proposal. I've given Google "advice" about things they might do in Cuba here, here and here -- I'll be curious to see what they propose and what the Cuban reaction is.